APPEARANCE: Pours a hazy over ripe tangerine fruit color, with bright 24k gold sparkling highlights. Has a beautiful loose, billowy off white head that sticks around for the long term with some super retention. AROMA: Fresh squeezed tropical fruit juice that has spilled onto a damp jungle floor. Pineapple, mango, guava peel. Some very interesting earthy, minty notes that get rounded out by sweet bready, doughy malts. TASTE: Wow ! Juicy mango burst right away. Followed by sweet ripe pineapple and peaches. Huge dank, wet earthy flavors that give way to a very layered hop profile. The malty sweetness on the nose comes into play only to give way to the crashing bitterness that hits on the backend. I can’t believe this is 10.5% absolutely no heat and so easy to drink. MOUTHFEEL: Medium body, medium prickly carbonation. Lovely expansive creaminess that coats the whole mouth before retracting super quick with the dry snappy finish. OVERALL: I received this a few months after release it had been properly cellared. I honestly can’t imagine how good this must have been fresh. This has blown my mind. This may be the best double/triple ipa I’ve had to date. So balanced but full of explosive flavors at the same time. I super confident in my rating of this truly masterful work of art! 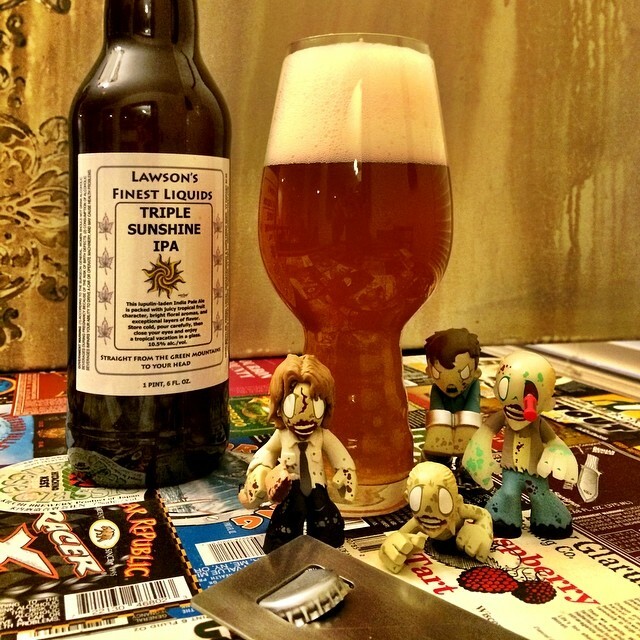 This entry was posted in Ales/IPA, Beer Reviews and tagged #beer, #beergeek, #beerme, #beernerd, #beerporn, #beerreview, #craftbeer, #craftbeerlover, #dtlv, #ipa, #lasvegas, #lawsons, #lv, #sincity, #sunshine, #triple, #tripleipa, #zombie, #zombies, tropical fruit juice by beerzombies1. Bookmark the permalink.